Continuity mistake: In the original Toy Story Sid uses a magnifying glass to make a permanent burn mark on Woody's forehead. 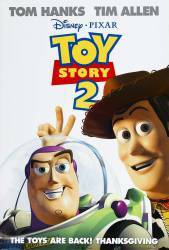 This seems to have disappeared for Toy Story 2. Continuity mistake: In the German Version: The group arrives at the Toy Market and a sign says "GESCHLOSSEN". The next time it is shown it says "CLOSED". (Geschlossen is the German word for closed).-It happens in the French version as well and in other Pixar films too. They arguably translated the most obvious words so that foreign people can understand, but they forgot some of them. 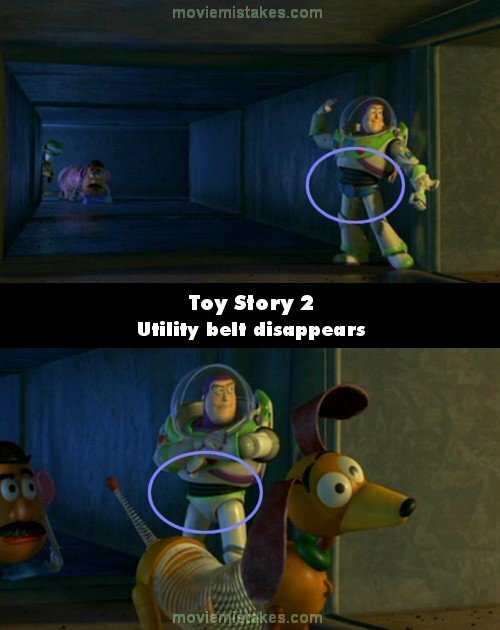 Continuity mistake: The movie released in Spanish cinemas showed the signs on Al's Toy Barn written in Spanish, but only during the first shots. Moments later they magically change to their original English text. Other mistake: When the toys burst through the air vent into Al's office, the other Buzz's laser goes off with out him touching it. Continuity mistake: When Rex breaks the fort with his tail, Mr. and Mrs. Potato are behind it but they disappear a few shots later.